Jump on a wild ride as Phineas and Ferb! 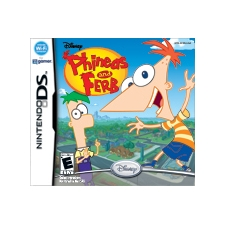 Build incredible inventions and ride extreme racecourses in Disney Phineas and Ferb for the Nintendo DS. Visit fun locations to find useful gadgets and missing parts to build the most awesome machines and rides. The fun never stops as you attempt to save the world as the Secret Agent P in a battle against the evil Dr. Doofenshmirtz! There's a whole lot of stuff to do before school starts and Phineas and Ferb plan to do it all.